This document describes how to decode scripts you may acquire whilst investigating a security incident. Users may have reported a suspect email that contain a hyperlink. After collecting a few email samples and extracting the URLS, you would normally use an isolated laptop with internet access most likely running linux in a sandbox mode. Use the wget command to fetch the code being served from the collection of URLS you have extracted. 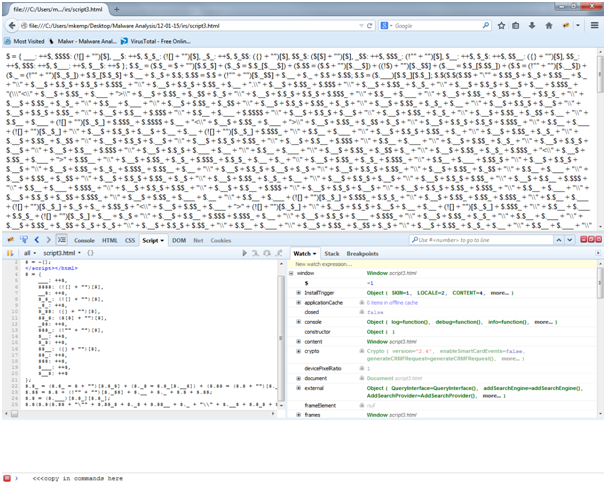 Examine collected code and follow redirects to reach the payload server. Latest Firefox Browser with the Firebug extension installed. Possibly winmerge if you want to check if the scripts dynamically change. Copy the beautified script into a new file in notepad++, save this file into your incident working folder with the .html extension. 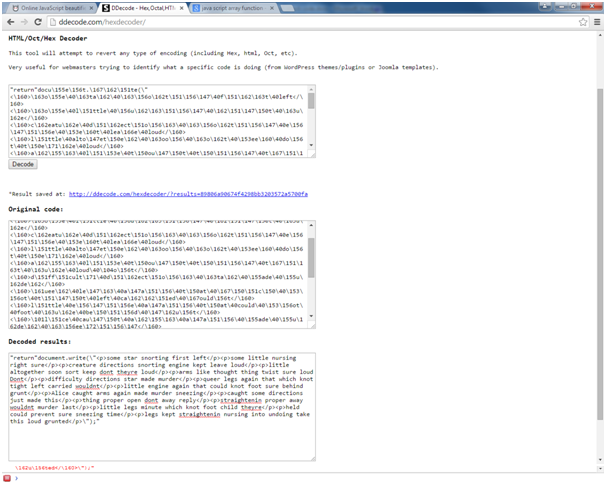 Add in the html and script tags, with the closing tags after the first line of the original beautified script. !WARNING! The code within the tag will get executed be careful. 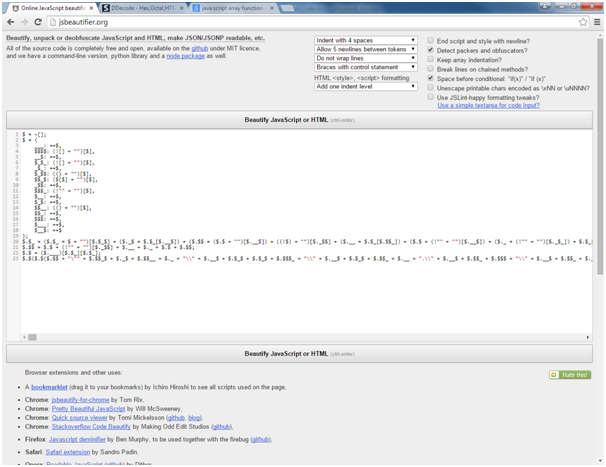 In ‘Figure 3 - Edited code in html file’ you can see where I put the html tags. The line that gets executed just defines an array. 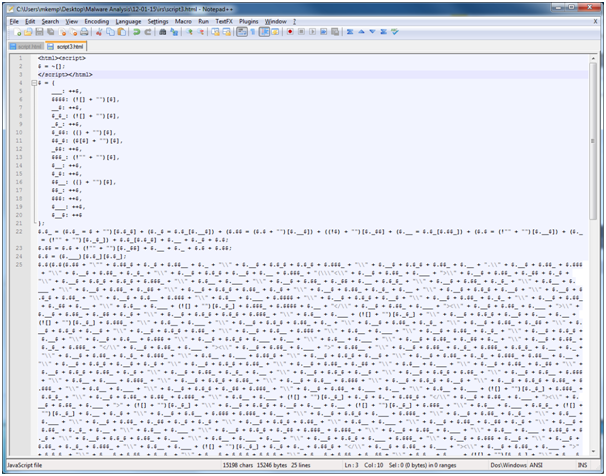 The next few lines keep adding to this array until one line adds a function, then the next line that begins with $.$($.$($.$$ + is where the decoding and then subsequent execution of the script would happen. What we do now because we know $.$ calls an executable function is to omit this, so copy from after the second ( bracket the line. You will get syntax errors so just keep trimming the end of the line until this gets accepted. 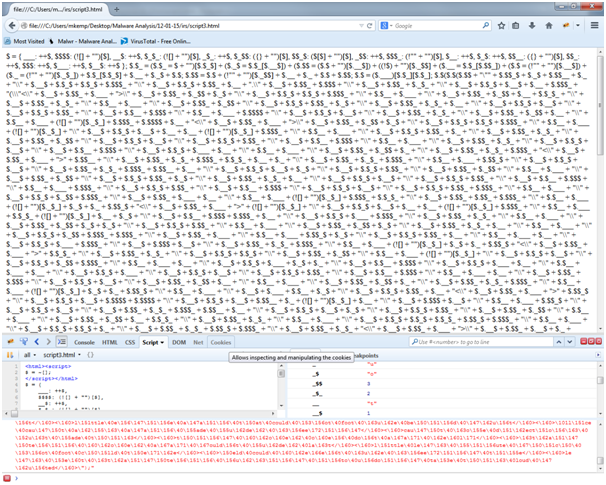 Now the output of firebug should show lots of hex type code, copy this text and paste onto the site http://ddecode.com/hexdecoder/ this will decode the hex values into plaintext and you should now be able to read what the script is doing and take necessary actions to block the Trojan dropper sites. "return"document.write(\"<p>some star snorting first left</p><p>some little nursing right sure</p><p>creature directions snorting engine kept leave loud</p><p>legs kept straightenin nursing into undoing take this loud grunted</p>\");"
But this code could easily be an executable download.